for another AEC/HCB HP see picture #41107 but the Cheltenham example is double cabbed. Added by Petros on 25 November 2018. I was working near Skegness in 1988 and seem to recall seeing one of these AEC's still in service .Would this be possible ? Added by Craigw on 28 November 2018. I don't think 23 years is unlikely for a snorkel in a smallish town, where it may not have had all that many runs. Quite a few British brigades have operated aerial ladders and platforms for over twenty years, including at one time even London. And some others have bought used units which have ended up having a service life of nearer thirty. 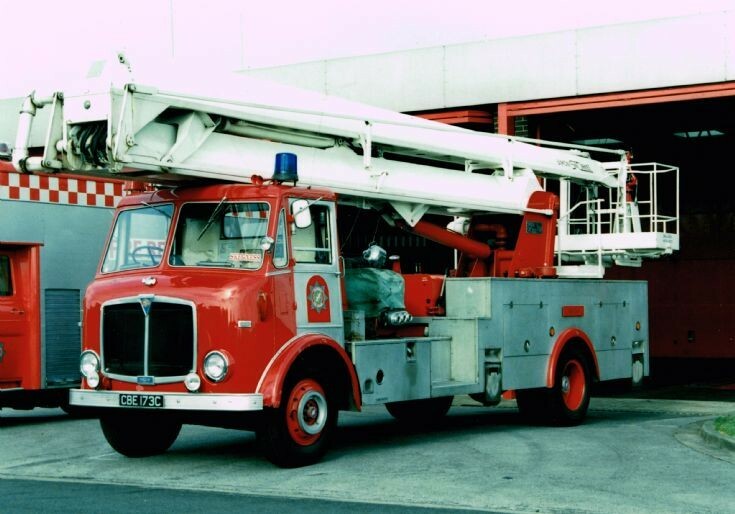 In Germany, where many of the 23, 000 volunteer fire companies have turntable ladders which get comparatively little use, it is common to see forty year old units still in use, and the VdF in Italy certainly have more than a few that are this old. Here in the US, FDNY try to keep their very busy ladders on the front line for no more than ten or twelve years, by when they are pretty knackered. But small town volunteer fire companies like the Long Island town I used to live in replaced two of their three aerials only after around thirty years on the front line - and they were sold to other small departments and went on to continue in service! Added by Rob Johnson on 28 November 2018. Suppose your right, 1988 is a long time ago now ! In fact I think my local Brigade, Cleveland, are still running a 30 year old HP. Added by Craigw on 29 November 2018.